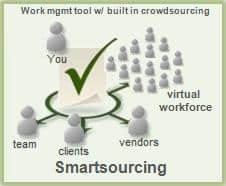 No, it’s not a title from the Department of Redundancy Dept., it’s CrowdFlower’s next newest Crowdsourcing Meetup meeting. They’ve coordinated a whole raft of cities and companies to participate in talking about what’s next in the world of paid crowdsourcing. “Because I love a technical challenge and distributed work this meetup is going to be in at least four locations at once! We have some awesome speakers in different locations and we're going broadcast between them. Because of time zone issues West coast will start with talks and then have mingling later, while east coast will start with mingling and end with talks. As usual we have a set of speakers that I really respect and I'm very excited to hear from, and as usual, they cover a range of business, art, academic and social issues around distributed work/crowdsourcing. We also have Jeff Howe speaking - the Wired writer who coined the term "crowdsourcing".